Title :SLAYERS RETURN the movie guide art book Language : Japanese. This is an official book. Release Date : 1996 Total Pages : 20 pages Condition : USED. Very Good. No missing page. 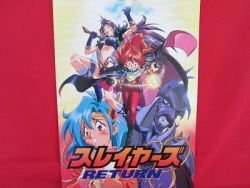 Description:This is a Japanese Anime (Manga) "SLAYERS RETURN the movie" Art Book (IllustrationBook). This book can be obtained only in the movie theater. It is a hard to find.